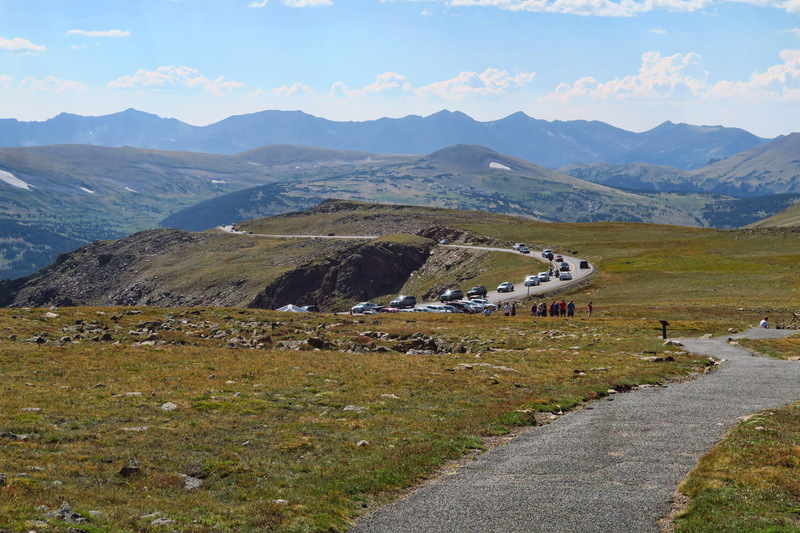 Connecting the quiet west side of Rocky Mountain National Park with its more popular east side near Estes Park is the NPS’ highest paved road, Trail Ridge Road. 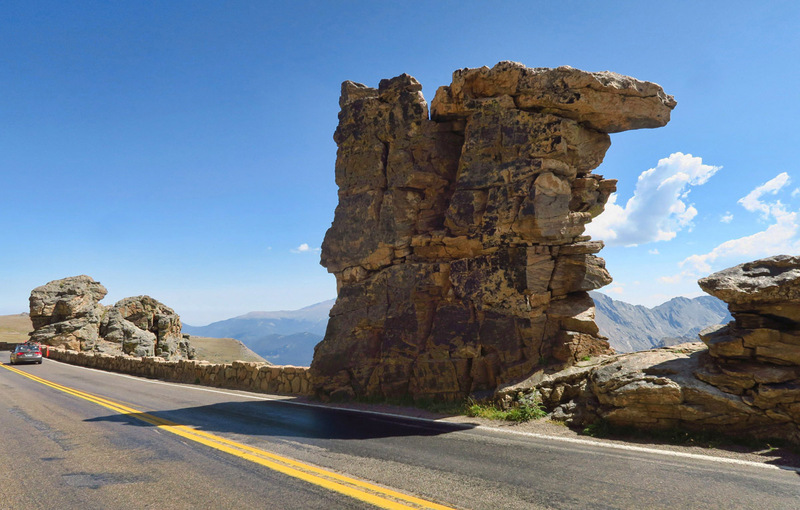 The scenic, twisting, winding road traverses through the heart of the park from Estes Park on the east side to Grand Lake on the west. It’s the only way to get from one side of the park to the other. 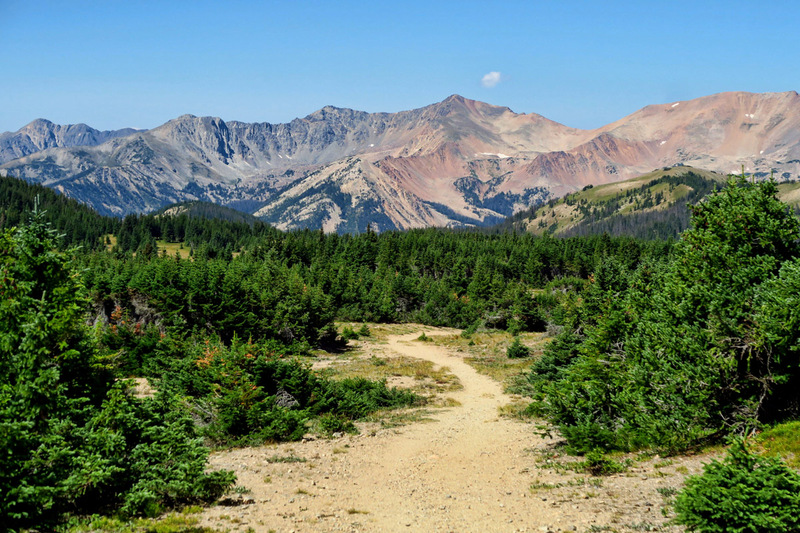 But more noteworthy, it’s the highest paved road in our national park system. 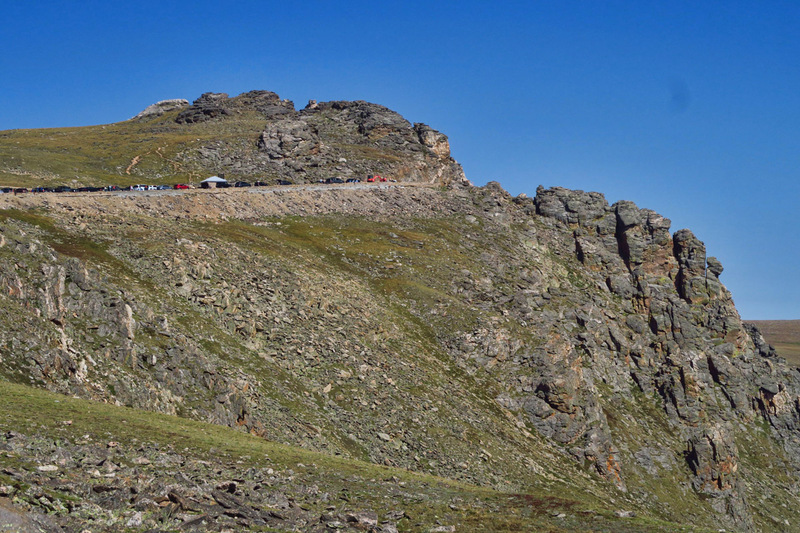 The two lane road is 48 miles long, ten of those miles above tree line, topping out at 12,183’. 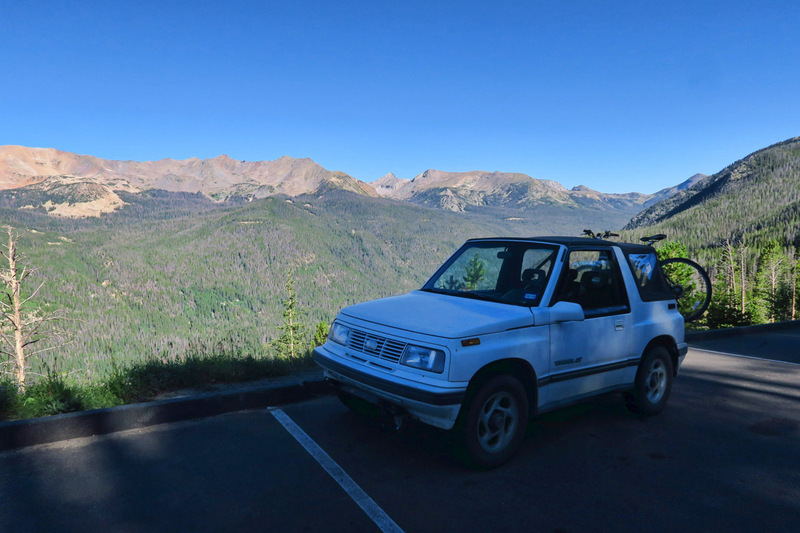 The Little Tracker doesn’t skip a beat up the Trail Ridge Road. Looking out over the Never Summer Mountains. 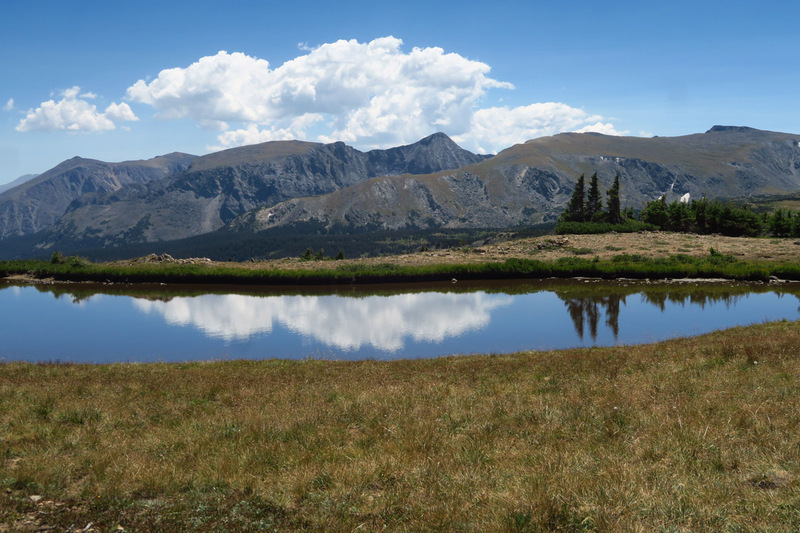 Treeline in Rocky Mountain National Park ends around 11,400′. Although I am not comfortable driving the rig towing across the road, I do want to drive a portion of it, if only the Tracker is up for the job. 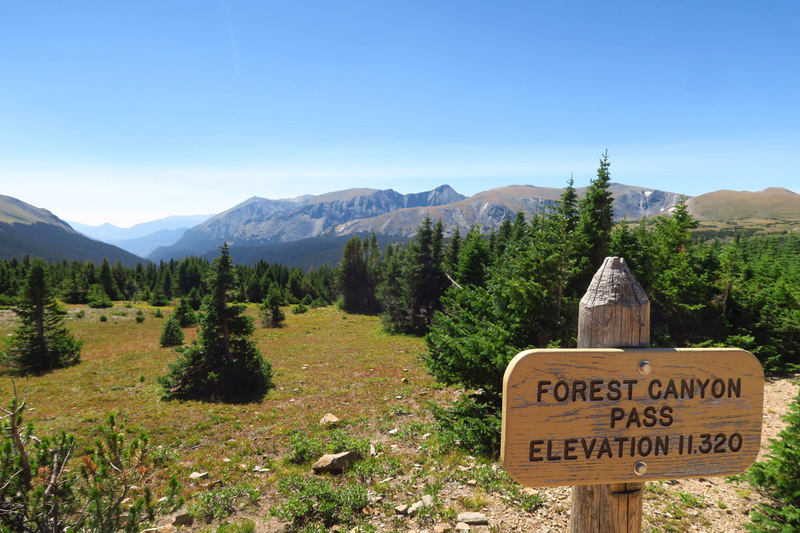 So I get an early start while the air is cool and crowds are light, check all the fluid levels, and start the gradual climb up the switchbacks, up 10,759′ and over Milner Pass across the Continental Divide, winding in and out tall lodgepole pines in the shadow of the Never Summer Mountains. 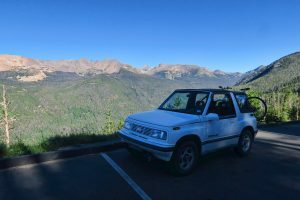 The Tracker handles the climb like a champ, and before I know it, I come to the turnout for the Alpine Visitor Center. 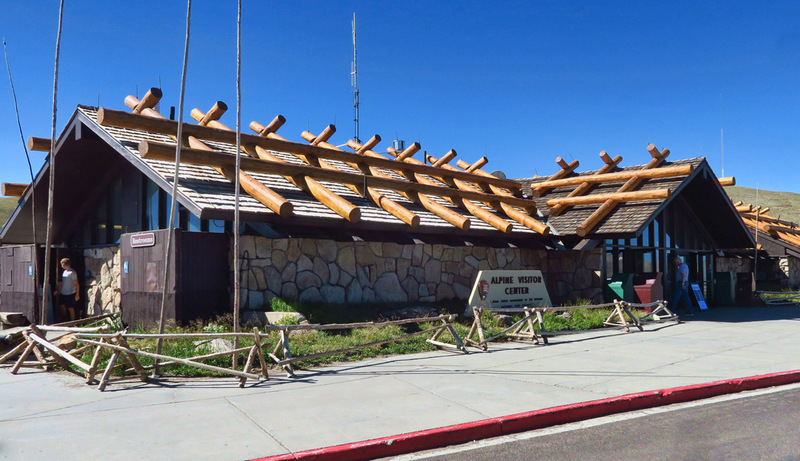 Alpine Visitor Center, at 11,796, highest VC in the Nat’l Park System. View from the Alpine Visitor Center. 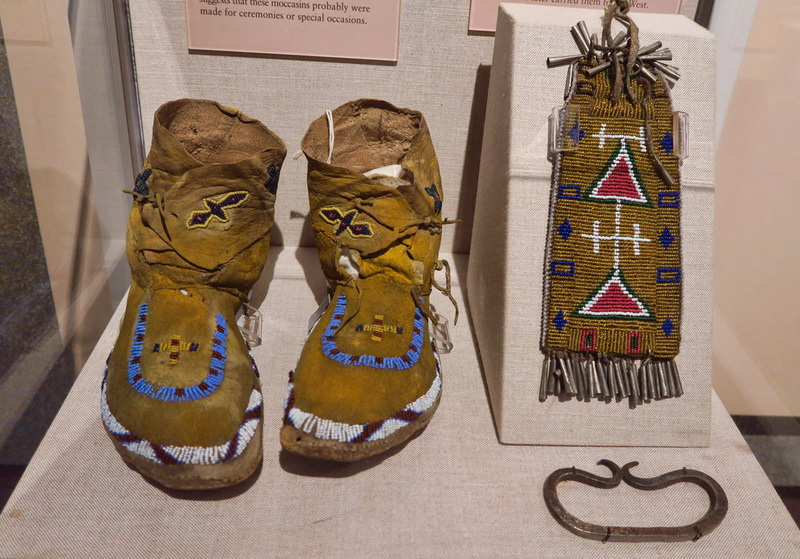 There are some Ute artifacts on display in the Alpine Visitor Center. 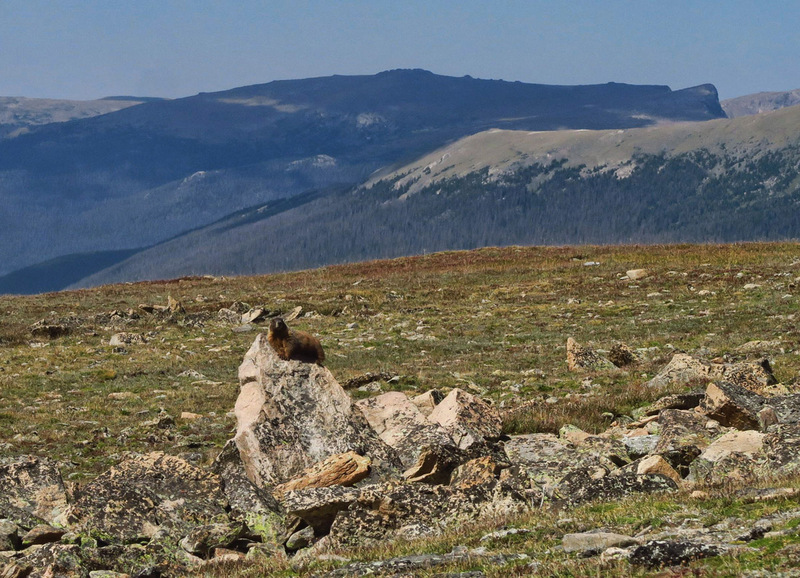 Given the alpine tundra is home to completely different flora and fauna than the lower regions of Rocky Mountain National Park, the tundra region has its own visitor center. 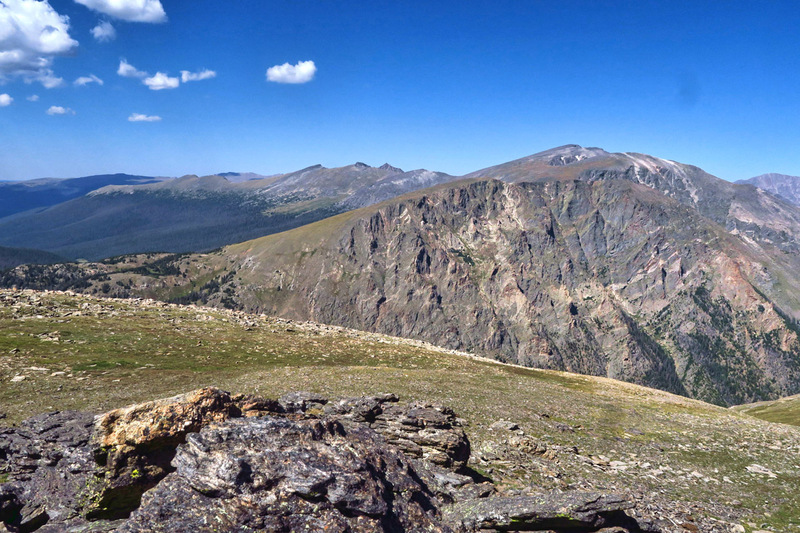 At 11,796’, it’s the highest visitor center in the national park system. Only open for five months of the year, the facility is fully self contained, relying on generator power, a small dam to catch snow melt for its water cache, and a daily sewage removal system. 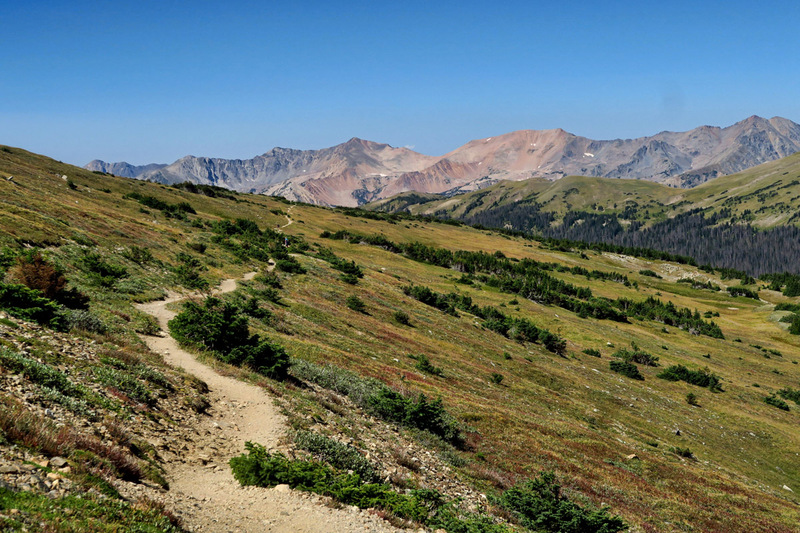 Heading out on the Ute Trail which starts out above treeline where the wind is brutal. Trail gradually descends and trees get larger. 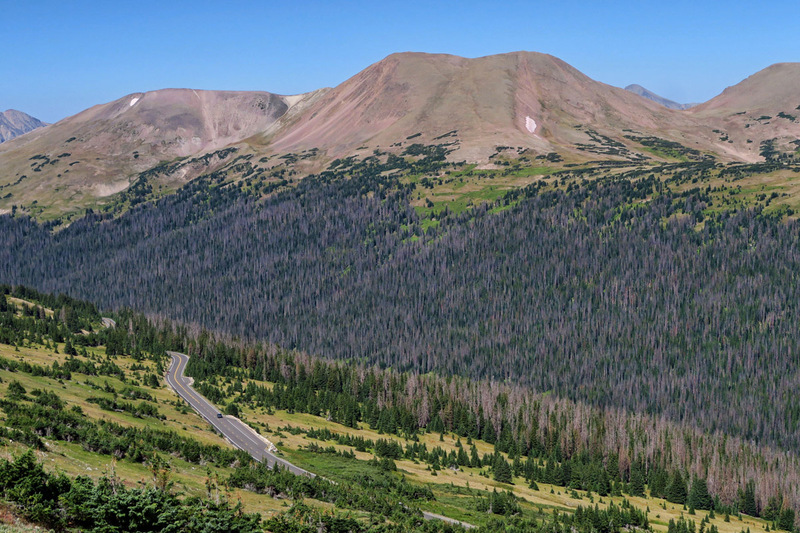 Trees may only grow an inch in diameter every one hundred years at this elevation. Sounds lovely! I shall make it my quest! 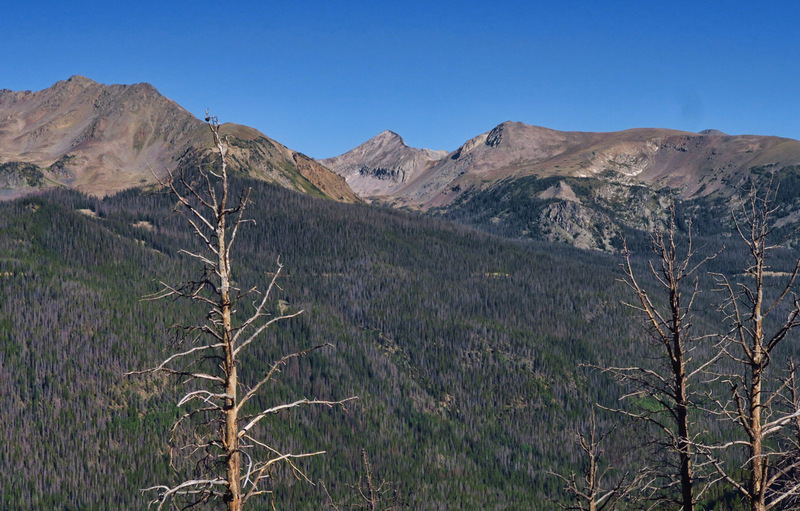 Looking down toward Forest Canyon. 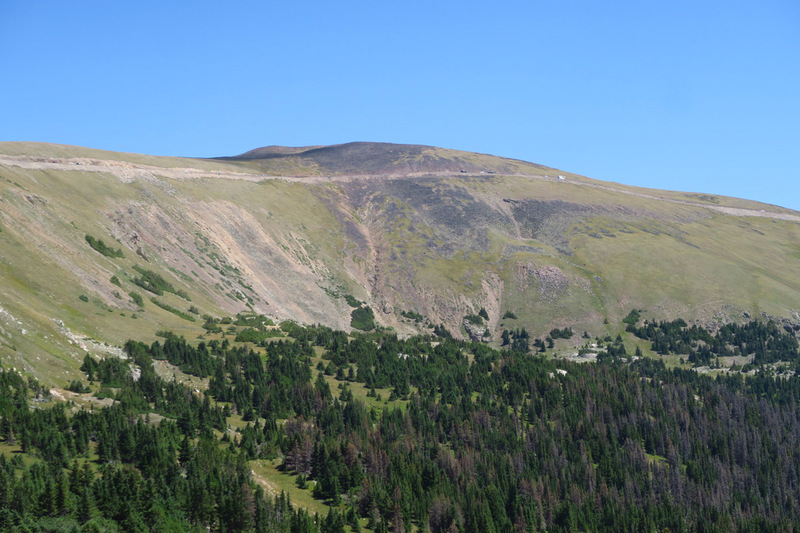 If you look closely at the top of the mound, you will see tiny specks of cars which are parked along Trail Ridge Road. In the upper right third of the photo, you see a tiny white dot, which is actually a Class A motorhome. Brave soul! 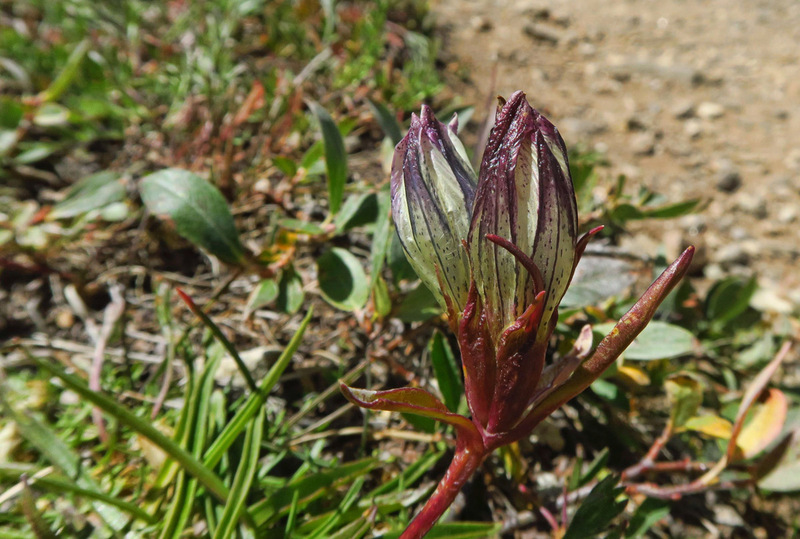 I hike almost the full four miles to Milner Pass and don’t see a sign of the alpine gentian. In fact, I am now below tree line, so no chance. I’m disappointed that I may have missed it, and even more disappointed that if the last flower has bloomed, summer’s ending may be even sooner than I realize. 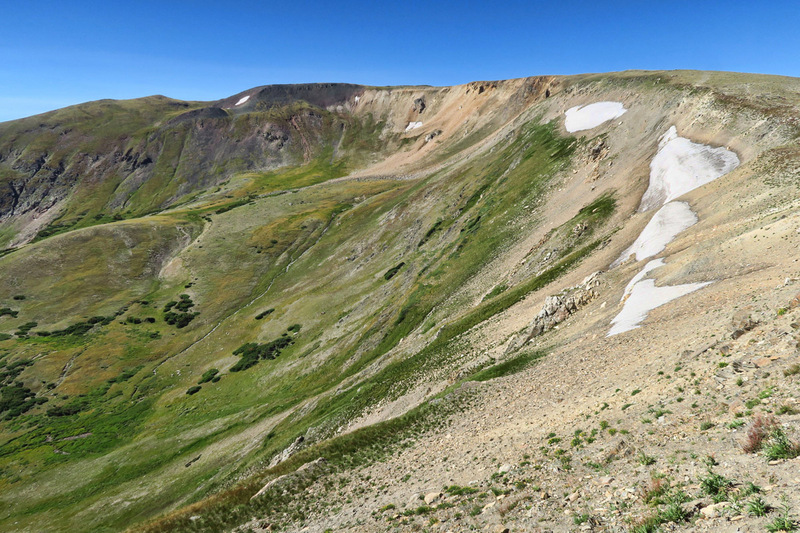 I continue on up the Trail Ridge Road, past the highest point at 12,183’, and on down to Rock Cut, a pull out alongside the road where a cut was blasted through the rugged side of the mountain to make way for the road. Climb the Tundra Communities Trail just a bit to leave much of the crowd behind. Rock formation on the right is the section called “Rock Cut” where they cut through to build the road. Rock Cut Turnout near the top of Trail Ridge Road. 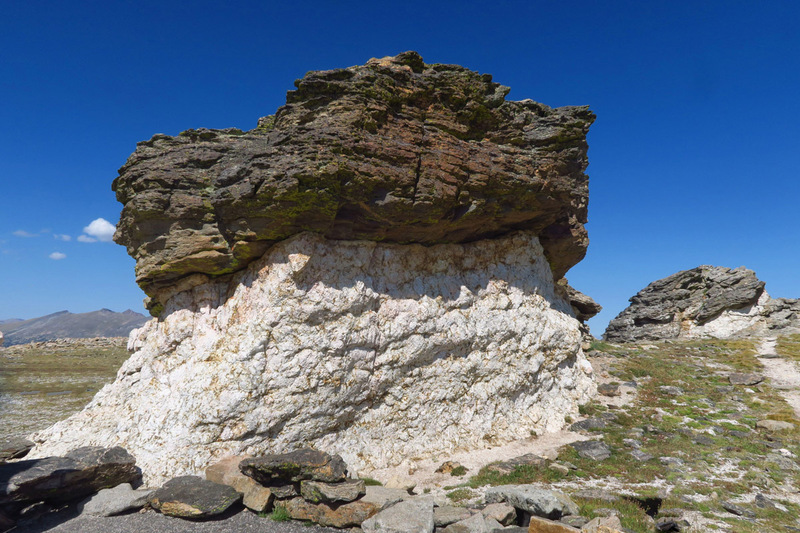 Views from Tundra Communities Trail. 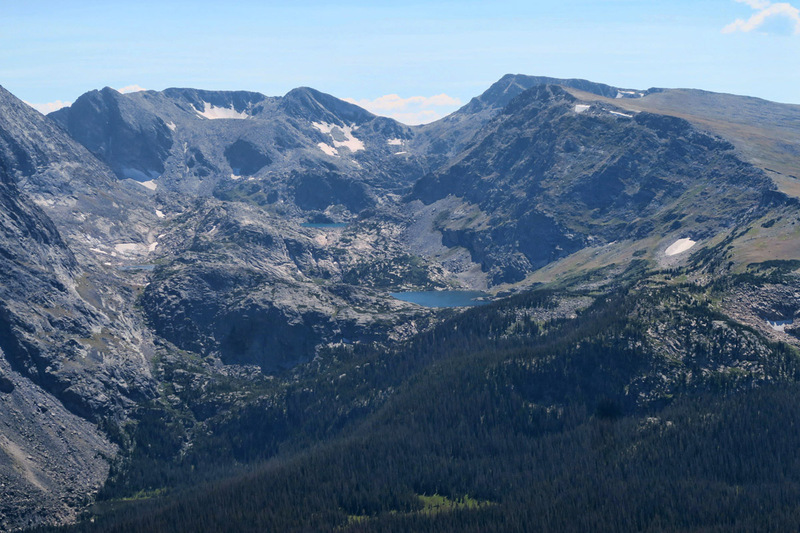 If you look closely, you can see three different alpine lakes. I must be honest in saying I would rather be over there than looking at them from the scenic drive. Rock Cut turnout is also the location of the 2 mile RT Tundra Communities Trail, which offers a chance to get up and out in the midst of the tundra while staying on a formal path. (Even though there are signs everywhere warning that it takes 100 years to recover, kids still run across the tundra, trampling it in their game of chase.) 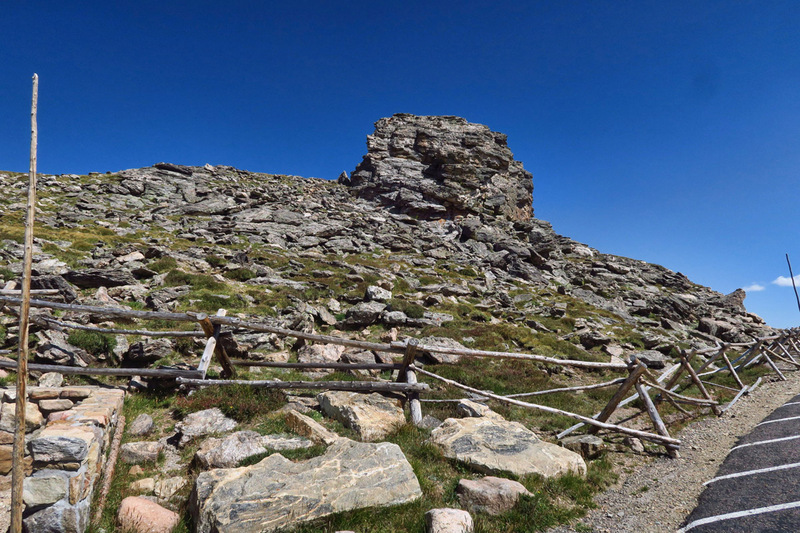 I take the path up, slowly scanning the ground for the alpine gentian. 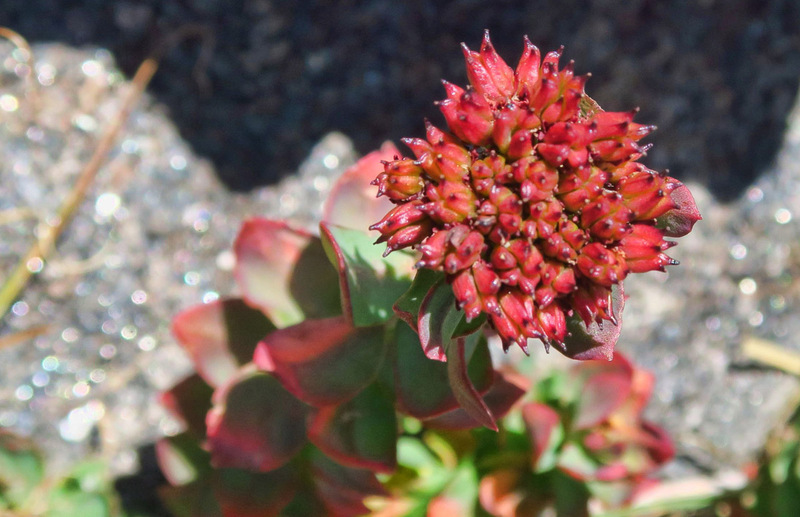 Like all alpine flowers, they hug the ground where it can be up to 30° warmer. At first, they continue to elude me. But then I see a clump of them right alongside the trail! Once I get a lock on them, it seems as if they are everywhere! 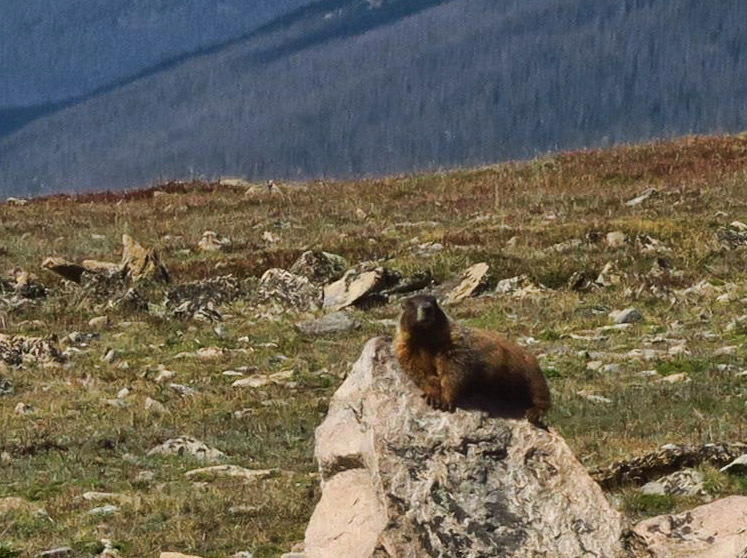 Lazy marmot sunbathing on a rock along the Tundra Communities Trail. Zoom in for a closer look. He looks pretty chill. 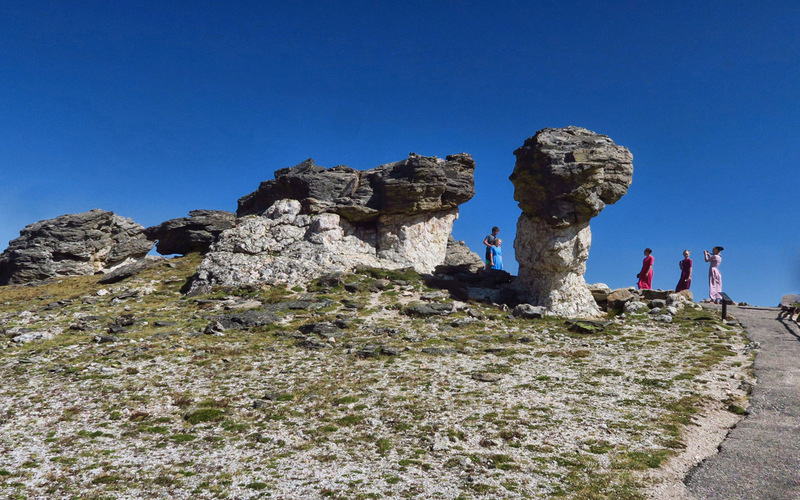 At the top of the Tundra Trail are some interesting mushroom rocks. 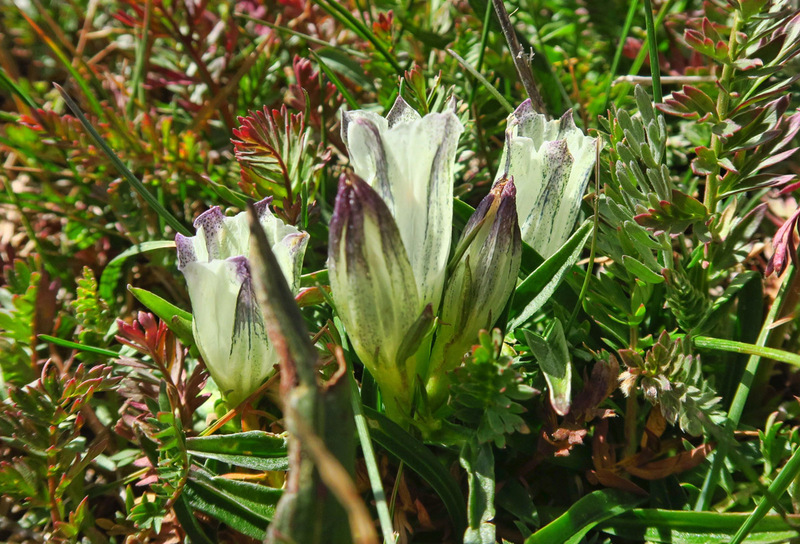 This entry was posted in Colorado, National Parks and tagged alpine gentian, Alpine Visitor Center, Rocky Mountain National Park, Trail Ridge Road, Tundra Communities Trail, Ute Trail, wildflowers by Suzanne. Bookmark the permalink. Beautiful words Nd photographs. 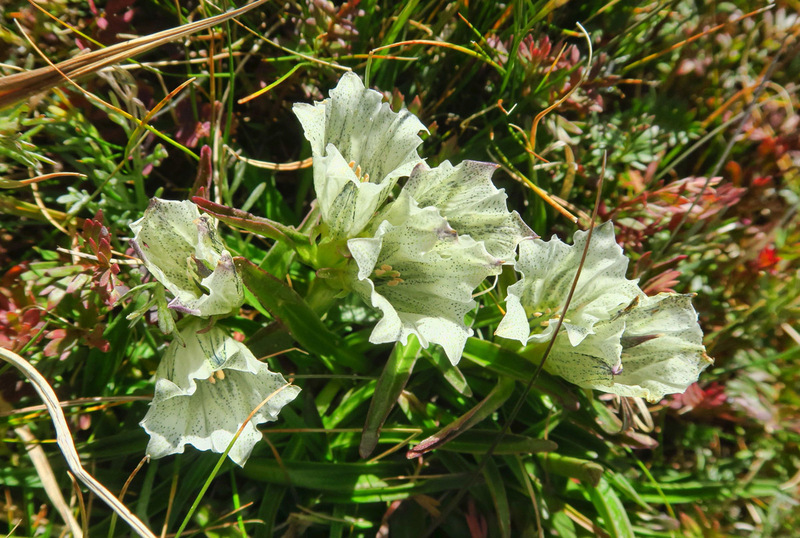 Had a feeling you would fine the alpine gentian in the end. 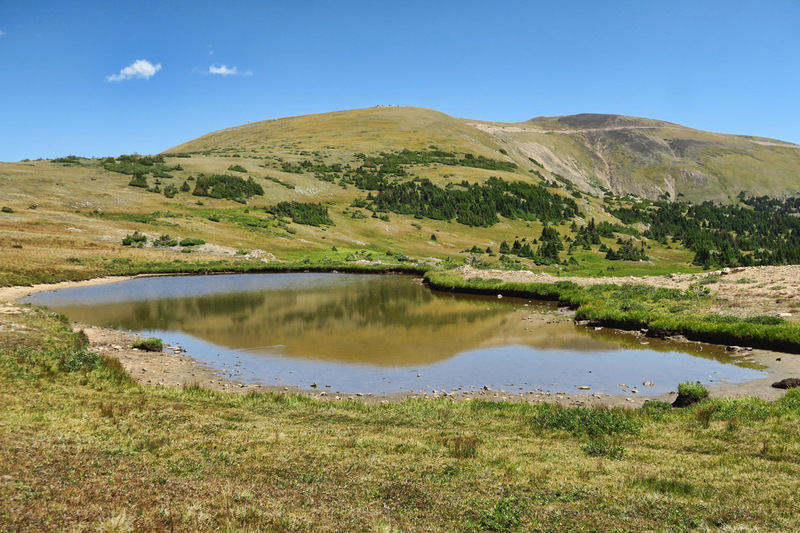 We backpacked to Arrowhead Lake (the largest of the three) from Milner Pass, it was a magnificent backcountry experience. Zero traces that anyone had ever been there before, beautiful views as you imagined and saw quite a few elk up close. Definitely not a day hike. 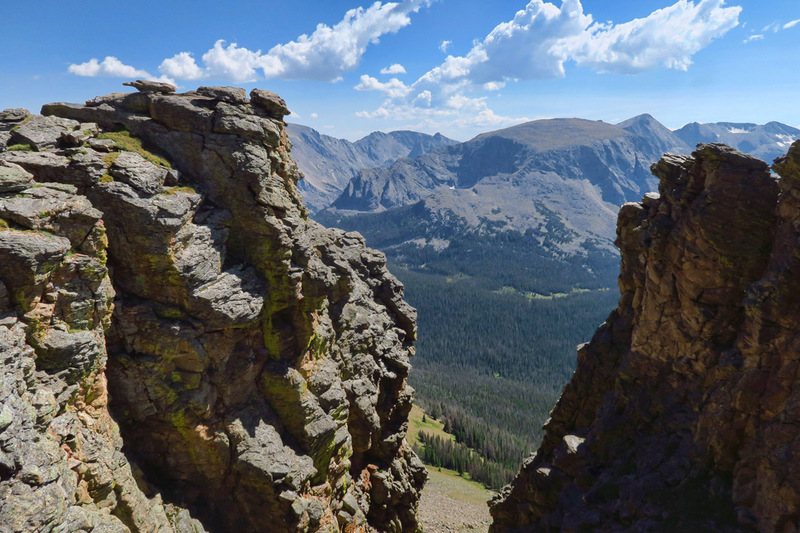 If you get a chance and are staying on the east side, hike to Black Lake, Chasm Lake or the Keyhole on Longs Peak. That is a really cool visitors center! We love those unique and out of the way places that not everyone sees. 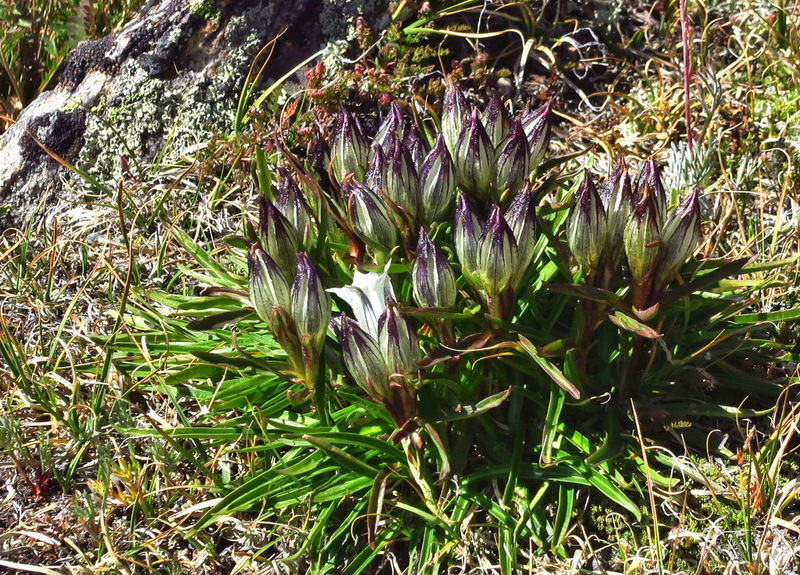 Congrats on seeing the Alpine Gentian, just think of how many people have never seen one of those! My heart felt a little stab of grief when I saw Ann Zwinger’s name. Do you remember that I told you about her when we were talking of doing a Colorado River trip? Off topic but her book, DownCanyon, is my favorite nature book of all times, and I’ll feel forever blessed that I was able to spend time with her. Her home was in Colorado Springs. 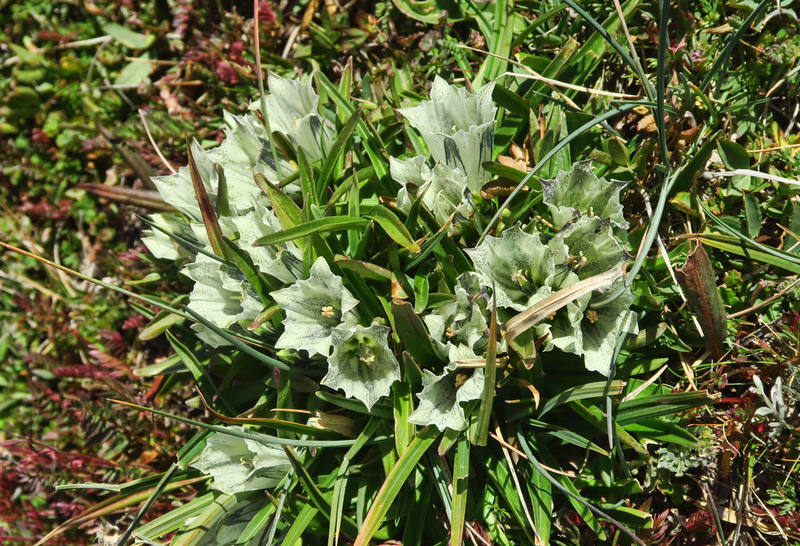 I’m so happy you found the Alpine Gentian! Kat, I do recall our conversation, but I did not make the connection to the author’s quote on the kiosk. That makes it all the more special. There was another quote by Ann Zwinger in the visitor center, which I also dearly loved. “…where the sky is the size of forever and the flowers are the size of a millisecond.” Your comments prompt me to find a copy of DownCanyon. Thanks. Yes, definitely find her book. I’m sure you’ll love it. Funny thing, I was looking at other’s comments here and saw Sue Malone mention that she also lives in southern OR…so I did a little searching and found she’s in Grants Pass…small world! I sent her a note. I’m headed to Ireland October 1 (and Africa next July!) so I’m not making it to the Wooden Boat Festival OR the Celebration of Art at the Grand Canyon this month. I haven’t used my van much this summer so I’m really enjoying reading about your adventures. We made that drive when we were in Colorado a couple of years ago. I hadn’t realized before that that the elevation was as great as it was at the top. 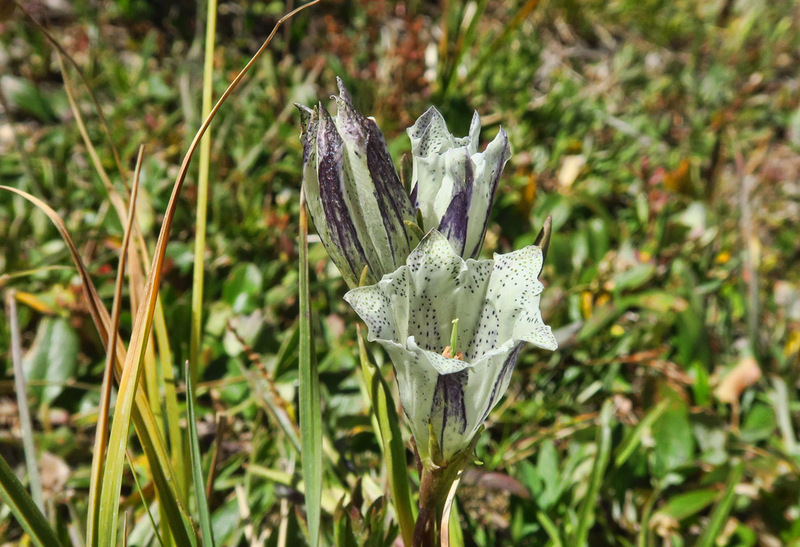 Glad you found the alpine gentian. 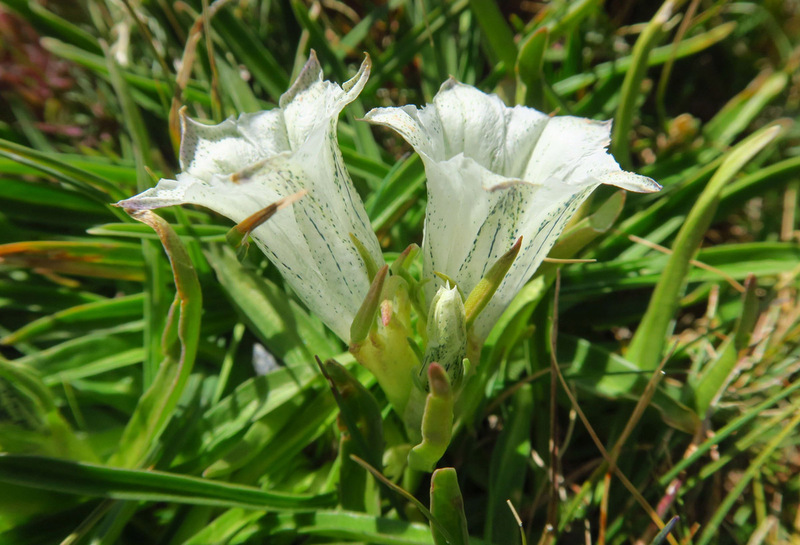 That story reminded me of the green gentian that we saw in Yellowstone last summer. I believe it grows for many years, then only blooms once before it dies. It was a delight to find it. Such a lovely place to explore. It took a bit of time but I did find the third elusive lake on the left. Suzanne, How do you feel at this height? Is there drowsiness or dizziness? Hi, Alex. I’ve been above 7,000 ft since I left Santa Fe in mid-June, so no problems. 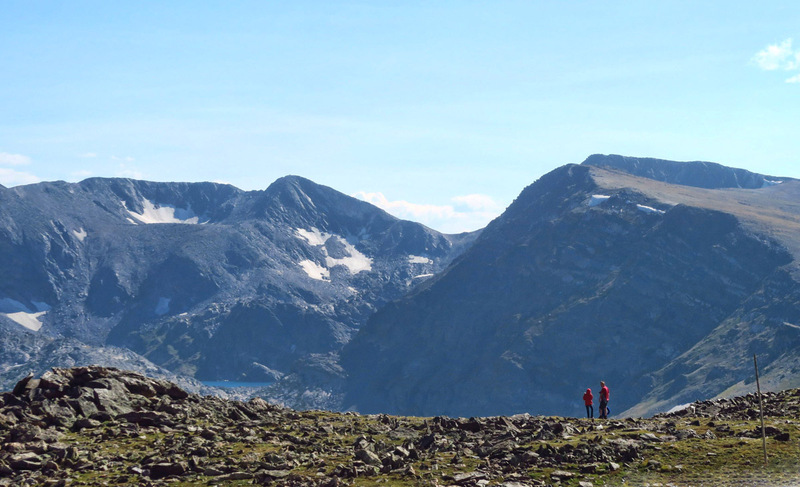 Hiking is admittedly slower at that height, but otherwise no other symptoms. Thanks for following the blog! Oh Good for you !!! You are in good shape !! Yes, I follow to your blog many Years and like your writing style. May be somewhere will meet You during the winter time … , who knows..